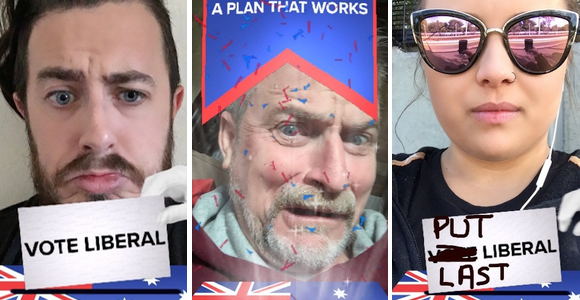 In a world first, the Liberal Party of Australia has become the first advertiser to use a Snapchat video lens in a political marketing campaign. It’s the day before the 2016 Federal Election. 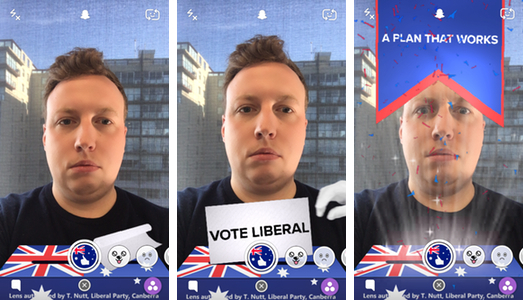 The blackout on free-to-air TV is in effect, and the Liberal Party has rolled out its secret weapon for getting in the faces of young people: Snapchat. Load up Snapchat today and you’ll see a sponsored video lens to apply to your selfie. It’s certainly a risky move. First, there’s the demographic and psychographic profile of Snapchat users working against it, but there’s also the fact that the main way of sharing snaps outside of the Snapchat app is by taking a screenshot. This means every snap we can being shared on social media has had the chance to be edited. Or rehearsed. Point being, few of the people sharing these outside Snapchat are doing it because they’re fans. But does that matter? Who knows. It’ll be hard to tell how many people share the lens in-app, and how many of those were smiling. A recent Peanuts movie promotion worldwide campaign was reported to have cost US$750,000 per day. Marketing has no idea how much this campaign cost the Liberal Party.